Ahead of his visit to the Melbourne Conservatorium of Music next week, world-renowned and acclaimed composer Stephen Goss speaks to Ken Murray about his compositional process, his influences, and what it’s like to hear your music performed by an orchestra. Hi Stephen. You grew up immersed in both classical and popular music styles. Does popular music play a role in your compositional style or aesthetic? Yes it does – I have very diverse listening tastes, and I like to be as broad as possible in my range of influences. This isn’t an unusual position these days, as many “classical” composers draw on the popular music they grew up with. I’m often inspired by jazz, prog rock, funk, and other popular music styles – I see my rhythm approach coming from groove-based music as much as it comes from Stravinsky and Bartok. I’m particularly interested in developing hybridised musical languages that combine two or more contrasting styles, and I’m especially drawn to stylistic gear shifts in my music that can create that unsettling feeling of not knowing what will happen next. Fractured Loop by Stephen Goss, performed by Thomas Carroll on cello and Graham Caskie on piano. What role do extra-musical themes and influences play in your compositional process? A large one. Much of my music is programmatic. It often has a narrative element and I like to evoke different places or times. I use novels, artworks, stories, poems, design, and a whole range of other impetuses when planning a piece. I think very much like an architect when I’m planning, because I believe that getting the proportions, structure and contrasts just right will lead to a better end result. The impetus drives the compositional process on each of these architectural levels, and acts as a consistent link between form, method and materials. You’ve written an impressive number of works for guitar in solo and chamber contexts. As a guitarist yourself, how do you approach writing for the instrument? I try to make each guitar piece suit the individual playing style of the guitarist who commissioned it. I like to think that I’m writing for someone else’s hands (and musical tastes) rather than my own. Consequently, a piece I write for Zoran Dukic will be completely different to one I write for David Russell, John Williams, or Aniello Desiderio. I tend to write away from the instrument, occasionally reaching for a guitar when I want to try out the practicability of a particular stretch, or right-hand pattern, or a campanella texture, for example. The number of concerti you have written in recent years is impressive – especially at a time when it could be argued that the concerto is an outdated form. What attracts you to writing these works? Well, I simply love writing for orchestra. The exhilaration and excitement I get when I hear an orchestra play my music is electrifying. I enjoy the interplay between soloist(s) and orchestra and the dramatic tension that underpins the concerto form. But the reason I’ve written so many – 10 and counting – is because people keep commissioning them! Watts Chapel by Stephen Goss, performed by Michael Partington on guitar. 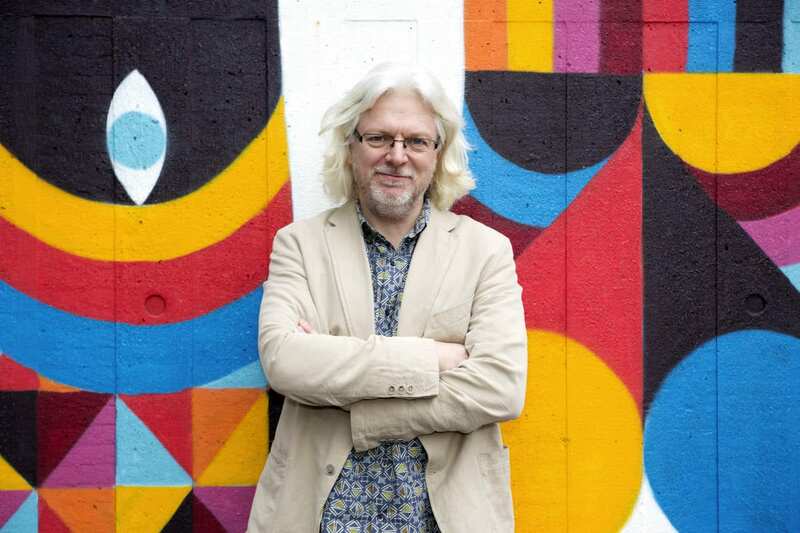 Stephen Goss is Chair of Composition at the University of Surrey, Director of the International Guitar Research Centre, and a Professor of Guitar at the Royal Academy of Music in London. His music receives hundreds of performances worldwide each year and has been recorded on over 70 CDs by more than a dozen record labels. His varied output includes orchestral and choral works, chamber music, and solo pieces. Stephen will be visiting the Melbourne Conservatorium of Music next week to work with composers, guitarists, and chamber musicians. The Guitar Ensemble and New Music Studio will present The Music of Stephen Goss on Friday 27 July at 7.30pm in Melba Hall. Register for this free event. Banner image: Stephen Goss. Photo by Luca Sage.